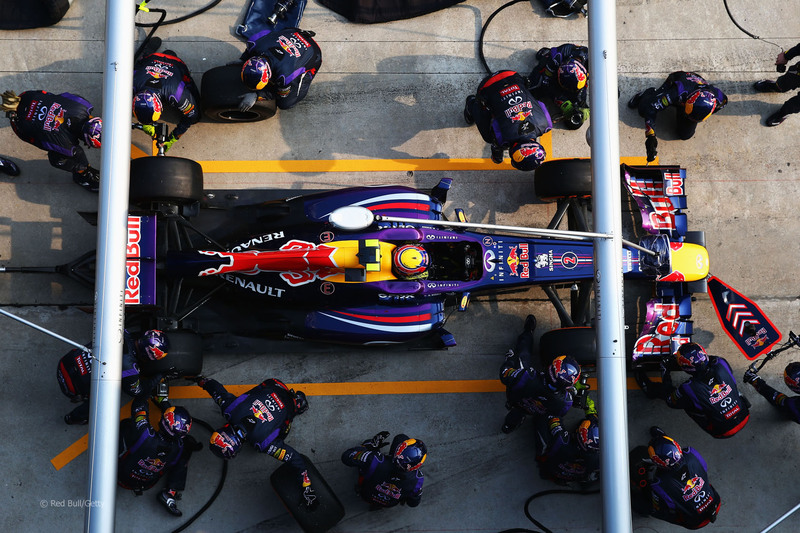 Is Formula One a team sport or an individual sport? This has to be the question on everyone’s mind after this weekend’s Malaysian Grand Prix. Team orders played into the first four finishing positions. In one team, orders were ignored. For the other, team orders were followed when it was clear the other driver was faster. 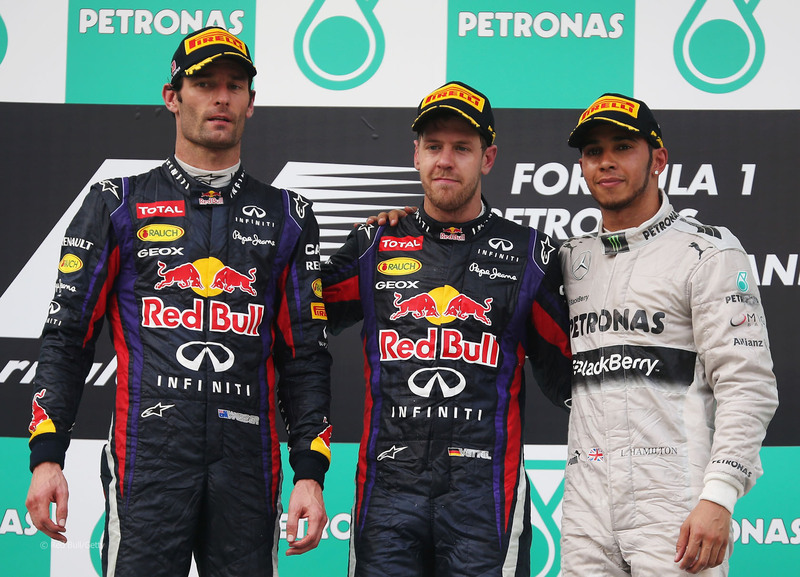 In a surprise for many cynical race fans, it was the Red Bull Racing boys who ignored team orders. Sebastian Vettel went by teammate Mark Webber after the race was supposed to be over between them and went on to take the win. The start of the race was just as exciting as the end. Fernando Alonso made the move from 3rd to 2nd and almost first in the first two turns as he powered up the inside of teammate Felipe Massa. The problem was that he bumped into the back of Vettel in Turn 2 which damaged his front wing. It was bad enough that the wing snapped off under braking at the start of Lap 2. The wing lodged itself under Alonso’s car and caused him to go straight at the end of the frontstretch, into the gravel and out of the race. 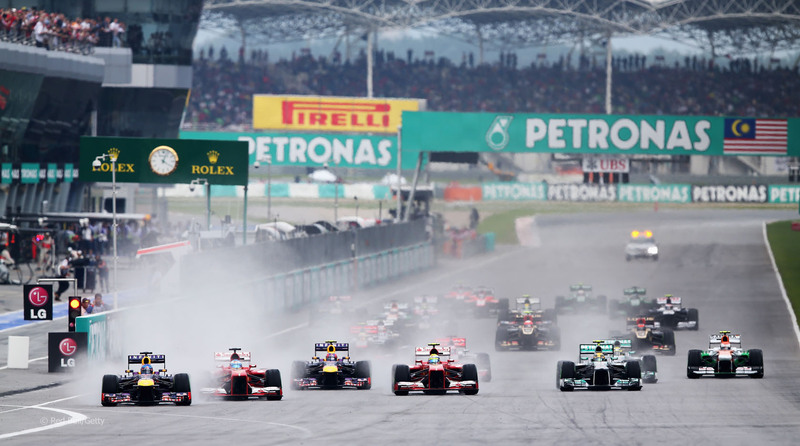 The start was run in the wet with the cars on intermediates. However, it didn’t take long for drivers to make the switch to slicks. Vettel pitted from the lead on Lap 5 but that turned out to be the wrong move because he lost out to teammate Webber who pitted on Lap 8. The difference in pit strategy put the Aussie on the point while Vettel struggled on a still drying circuit. Two laps later, Vettel snuck up behind an unsuspecting Webber and pass him around the outside into Turn 4 and stormed away. Webber said after the race that the race among the Red Bull teammates is supposed to be to the final pit stop at which point they hold station and bring the cars home. Vettel ignored team orders and took the win. 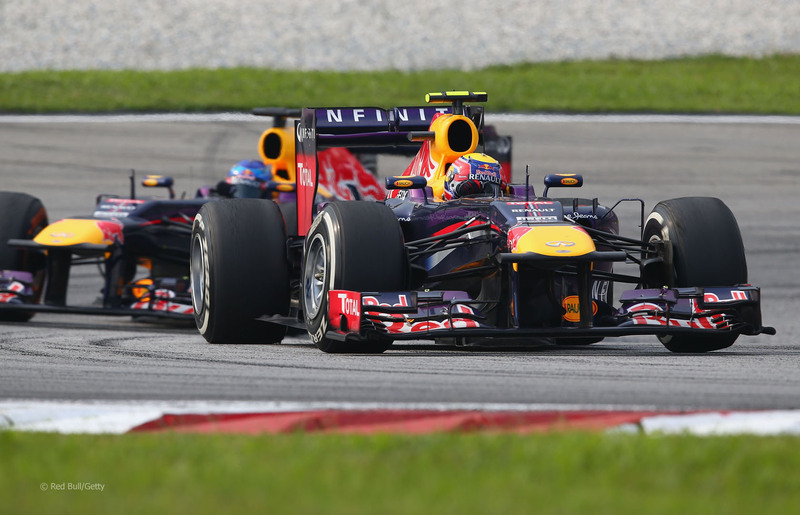 Behind the Red Bull fight, the two Mercedes drivers were having a fight of their own. Lewis Hamilton led the battle between he and Nico Rosberg for most of the race. After the final pit stop, the two traded passes for a couple of laps before Nico got the call to get in line behind Lewis. So the final order was Vettel picking up 27th career win which ties him with Sir Jackie Stewart at 6th all-time. Webber came home quite angry in second. Hamilton was admittedly embarrassed in 3rd as he thought Rosberg, who finished 4th, should have been allowed to pass him as Nico was faster. Elsewhere in the points, Felipe Massa had a quiet day en route to a 5th place finish. Romain Grosjean got a good start and timed his switch to slicks perfectly to get to 6th. Teammate Kimi Raikkonen was stuck back a bit in the field thanks to a grid penalty that left him starting 10th but finishing 7th. Nico Hulkenberg was actually able to start this race and rewarded Sauber with their first points of the season with an 8th. Sergio Perez and Jean-Eric Vergne rounded out the points to get their first scores of the season. It wasn’t really a good day to work for many teams. In addition to the team orders controversies, a few teams had issues on pit road. Toro Rosso received a fine for an unsafe release of Jean-Eric Vergne from a stop. Hamilton made a sort of inevitable error when he pulled into the McLaren pit stall for service. Fortunately, he was able to carry on to the Mercedes garage for his new tyres. 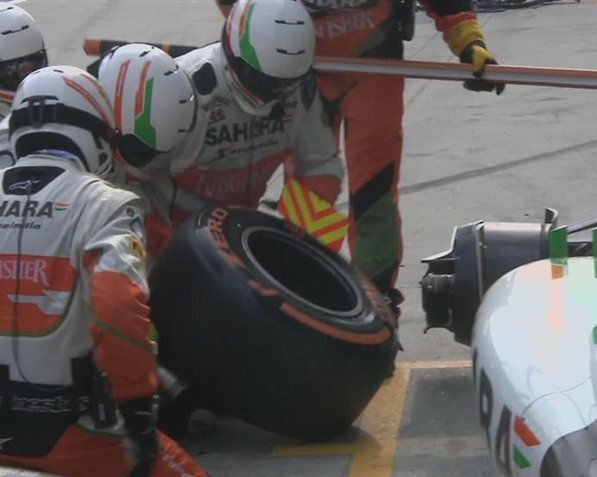 Speaking of tyres, Force India and McLaren had problems with theirs. Force India was trying a new wheel nut that caused all sorts of problems with their stops. Both cars were retired with overheating issues and one would have to figure that those issues would have started with exceptionally long pit stops. Similarly, McLaren had a problem with one of Jenson Button’s pit stops and had to stop him before leaving pit road so they could properly attach his left-front wheel. So it’s not just the driver and cars that are affected by the oppressive heat and humidity of Malaysia but it appears the teams are just as vulnerable. This week’s interesting off-track news came from the back of the grid. It turns out that Caterham and Marussia had been discussing the possibility of merging the two teams before the start of the season which would have seen the grid drop by two teams to 10 on the grid in 2013. 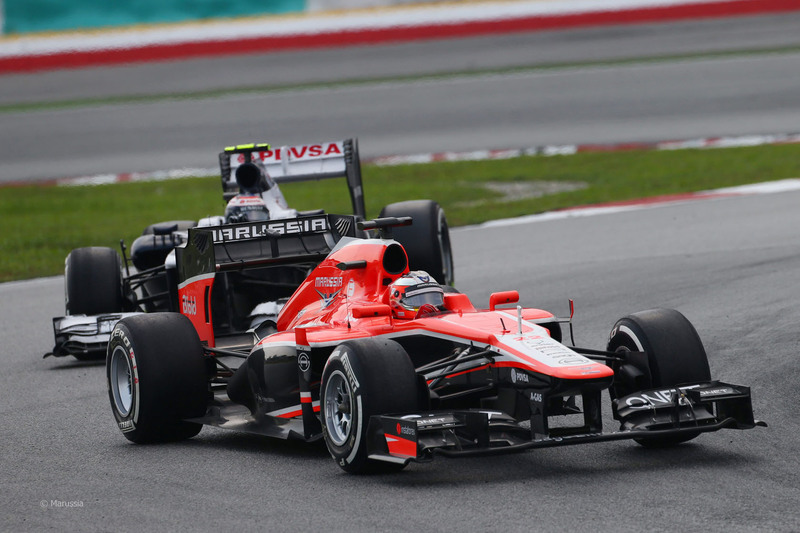 Clearly that merger never happened and Marussia looks better for it but what would have happened if the two teams did merge. Sure, the combined effort would have gotten the 10th place prize money but would everyone’s sponsors be happy with that? 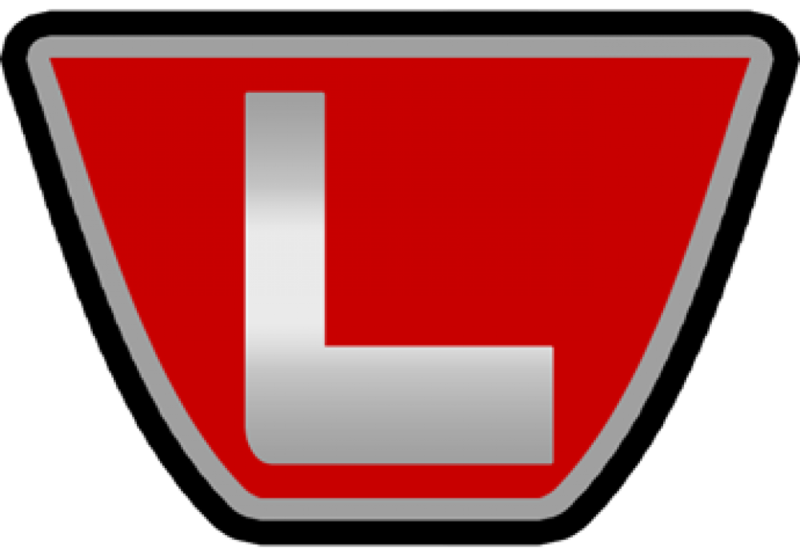 A factory would go empty, upwards of half the people currently employed by both teams would be fired and two drivers would probably have been forced to jump ship to sports cars. That’s definitely not the best solution for all involved. Interestingly, that same report noted that Marussia cut its planned 2013 by about one-third after missing out on the £10 million prize for finishing 10th in the Constructors’ Championship. Extrapolating that would indicate that Marussia would have run on a £30 million budget in 2013 (as £10 million is one-third of £30 million) had they not finished 11th. Kind of amazing that a team can be moderately competitive in F1 for £10 million per car which is less than it costs £16.5 million ($25 million) to run a competitive NASCAR team for a year. Speaking of budgets, while Marussia is reportedly planning to spend $30 million this season, the defending World Constructors’ Champions spent almost ten times that amount to win their third-consecutive championship last season. According to the Wall Street Journal, Red Bull spent about $286.5 million last season which is $42 million more than nearest spending rival McLaren. For all the talk about cost cutting and cost containment, it’s still not cheap to go racing in F1. Sure, it’s less expensive than the half-billion dollars per year that Toyota was rumoured to be spending but it’s not affordable for a new team to spend its way to the front. While I don’t mind that F1 is expensive, it should still be sustainable for teams to run in it. It’s hard to make that argument when winning a title costs nearly $300 million. It’s an arbitrary number but if F1 can limit spending to closer to $200 million per season, it’ll be a start. Max Mosley’s old £30 million ($45 million) budget cap was unrealistic. Since the reigning in the spending of the top teams to level the playing field was the goal of the budget cap, getting a team like Red Bull to cut 30% or McLaren to cut 20% would be difficult but not impossible. Getting Red Bull to cut 85% of their spending would be impossible. It’s not the perfect solution to improving parity and financial stability in F1 but it would be a decent start. Elsewhere off-track, the FIA once again had problems with the race control to car telemetry and communication system. As was the case last week, the DRS couldn’t be disabled after the 2nd lap of the race, in-car warning lights for flags weren’t working and the safety car mode (the delta time so a car doesn’t speed under full-course yellow) had to be enabled manually. The first time in Australia was written off by most as the result of setting up at a temporary circuit. Now, it’s clear there’s a problem with the FIA’s setup. What I want to know is why they’ve suddenly developed a problem after the system worked without a hitch last year? While I don’t mind drivers having to look for flags rather than a warning light on the steering wheel, it’s the DRS that worries me. Until the FIA and the race stewards come up with a way of ensuring that DRS isn’t abused in yellow flag zones, this has the potential to become a massive and embarrassing problem. 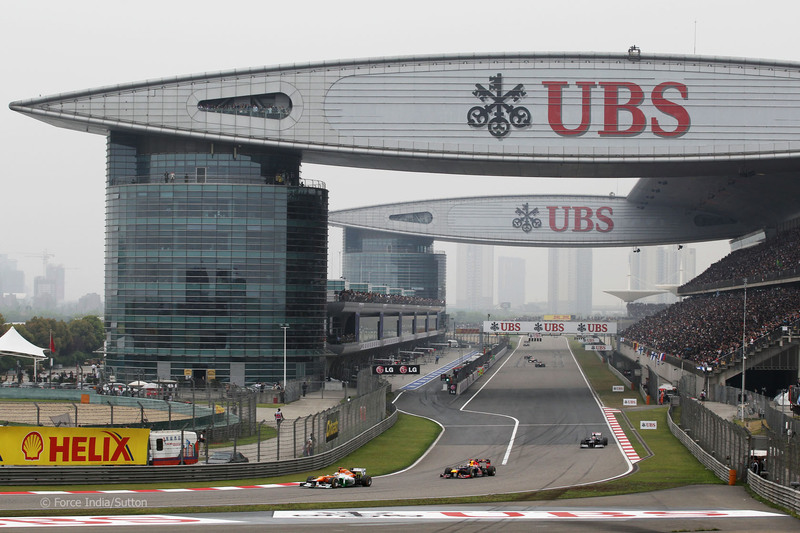 The next round of the 2013 Formula One World Championship is in three weeks’ time in Shanghai for the Chinese Grand Prix. I’ve never understood the two weeks on, two weeks off, two weeks on, two weeks off that the FIA have liked to start the season recently. It disrupts any rhythm the teams try to establish. I’d hazard this is worse on the mechanics than two weeks between races as a standard. After all, the FIA introduced the curfew to make life easier for the crews so why undo it with this schedule. It’s another Hermann Tilke track so you have to like the Red Bulls there again… Unless they try to take each other out after the fun of this weekend. The Mercedes were fast there last season, though it was the beginning of the end for their quick pace last year. Given how fast the two Silver Arrows have been this year, it wouldn’t be too surprising to see Hamilton or Rosberg on the top step of the podium. Again, that’s assuming they don’t take each other out over team orders either. If those two teams implode, Ferrari would be poised to take the chequered flag, mostly by process of elimination.